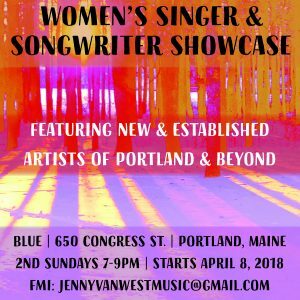 Featuring new and established women singers & songwriters of Portland & beyond. 4x25 minute showcases of great music by the women all around you. With a crystalline voice that has been characterized as “somewhere between Aimee Mann and Bonnie Raitt,” songwriter Jenny Van West released her first album Something Real in 2015 and the EP Honey & Hive in 2016, both produced by Ed DesJardins in Readfield. Winner of the 2015 Maine Songwriters Association songwriting contest and a finalist in 2017, Van is releasing her new album of original songs Happiness to Burn, produced by internationally-acclaimed singer-songwriter Shane Alexander in Los Angeles, in April 2018.